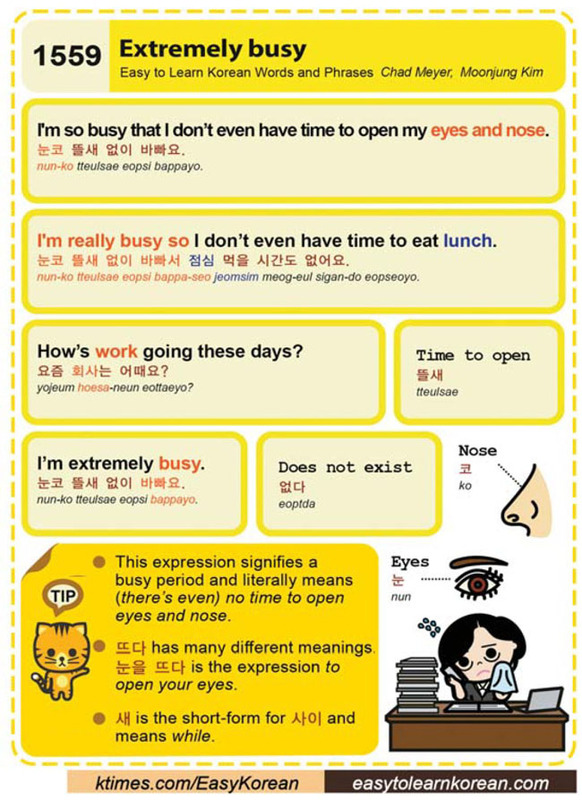 Easy to Learn Korean 1559 – Extremely busy. This entry was posted in Series and tagged does not exist, extremely busy, eyes, How’s work going these days?, I'm really busy so I don’t even have time to eat lunch., I'm so busy that I don’t even have time to open my eyes and nose., I’m extremely busy., no time to open eyes and nose, nose, nun-ko tteulsae eopsi bappayo., open your eyes, time to open, while, 눈, 눈코 뜰새 없이 바빠서 점심 먹을 시간도 없어요., 눈코 뜰새 없이 바빠요., 뜨다, 뜰새, 문을 뜨다, 사이, 새, 없다, 요즘 회사는 어때요?, 코 by easykorean. Bookmark the permalink.